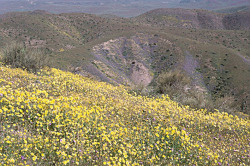 Photo taken in the Tumey Hills, Fresno County © Dean W. Taylor. Photo taken in San Benito County © 1995 Dean W. Taylor. 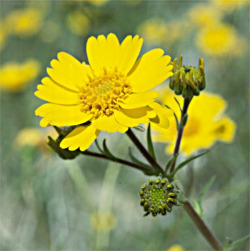 Annual herb 1–9 dm tall, stem glandular-hairy, glands yellowish or purple, lateral branches often > central stem; flowers showy, in open ± flat-topped clusters; involucre depressed-spheric; ray flowers 8–16, corolla golden yellow, ray 6–19 mm long; disk flowers 18–65, bisexual, anthers yellow to brownish; paleae free, readily falling; ray fruit compressed, strongly arched, dark or mottled, beaked, beak adaxially offset, curved, disk fruit not beaked (Baldwin 2013). Very similar in gross habit and appearance to Monolopia major (which differs in having a naked receptacle, i.e. without paleae). Also confused with Deninandra halliana (with disk flowers all staminate and paleae in 1 series) (Baldwin 2013). None locally; Tumey Hills (Fresno County). Endemic to Caifornia in the San Joaquin Valley/San Francisco Bay Area, and Inner South Coast Range in Contra Costa (presumed extirpated), Fresno, Kings, Kern, Monterey (presumed extrpated), Santa Barbara (presumed extirpated), San Benito, Santa Clara, San Joaquin (presumed exirpated), San Luis Obispo, and Stanislaus counties (Baldwin 2013, CNPS 2011). It is still the case that little information exists about this species. The CNPS Inventory (2011) states that occurrences are scattered and collections quite old with fieldwork needed. 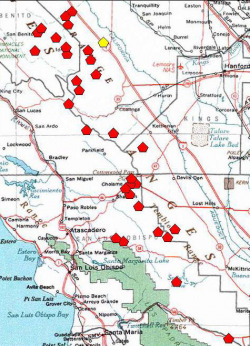 Extirpated localities are in the northern end of the range in the Mount Diablo region. This species is likely to occur in the the SCoR portions of Stanislaus and Merced counties. Two reported occurrences from the floor of the San Joaquin Valley in Kern County are unverified. Plants are easily damaged by cattle of trampling of clay soils on steep hills and are threatened by non-native species (CNPS 2011). Baldwin, B. G. 2013. 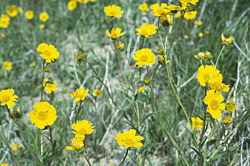 Madia radiata, in Jepson Flora Project (eds.). Jepson eFlora, http://ucjeps.berkeley.edu/cgi-bin/get_IJM.pl?tid=4053 [accessed 20 February 2015]. CNPS, Rare Plant Program. 2011. 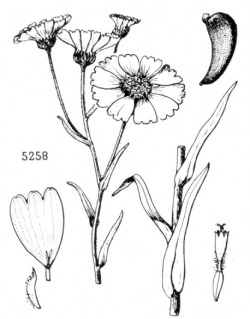 Madia radiata, in Inventory of Rare and Endangered Plants (online edition, v8-02). California Native Plant Society, Sacramento, CA. http://www.rareplants.cnps.org/detail/1054.html [accessed 20 February 2015]. Ferris, R. S. 1960. Illustrated flora of the Pacific States, vol. 4. Stanford University Press, Stanford, CA.